$50.0 (2 bids) Rare Tiffany St James Pat. 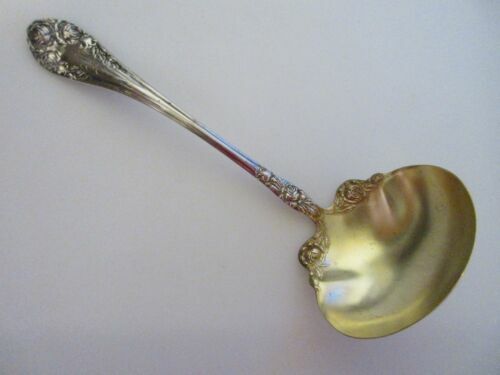 Sterling Silver Ruffled Gravy Ladle 7" long 1898 NR! $49.99 ADAM Silverplate Soup or Punch Ladle 1917 ONEIDA COMMUNITY Flatware 10-3/4"
Buy: $825.0 Wallace Baroque Silverplate Punch Bowl, Tray, Ladle and 24 Cups. $9.95 Antique 1915 Grecian Pattern by 1881 Rogers A1 Silverplate Gravy Ladle 7"
Buy: $84.99 Beautiful (RARE)(CHARTER OAK Pattern) XL Ladle (12.5") 1847 Rogers Silver Plate!